We’d love your help. 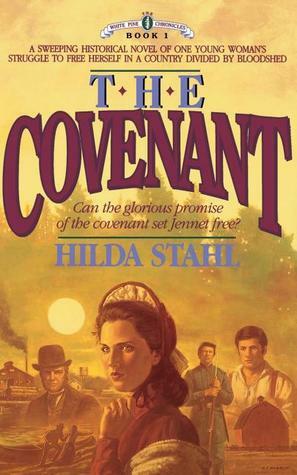 Let us know what’s wrong with this preview of The Covenant by Hilda Stahl. This first book of The White Pines Chronicles is a sweeping historical novel of Janet Cordell's struggle to find freedom in a land torn by the Civil War. It is also the revealing story of the lumber barons who amassed millions of dollars as they robbed the northern midwest of its beautiful white pines. To ask other readers questions about The Covenant, please sign up. will God take her? What is His plan for her life? Can she let go of the bitterness and unforgiveness residing in her heart? And what about her husbands bitterness towards his past as well? Can God heal them? Find out! .... This book held my attention and was hard for me to put down :) There were very few things that I didn't like about it. A well written romance, set during the end of the Civil War in Michigan. The progression of the lives of the lead characters is compelling as they come to realize their need for God and the gifts He brings to them as they come to know him. An old favorite that I still practically have memorized. It is always interesting reading a book like this, that you enjoyed, from an old married woman's point of view though. This was a very good book and it talked about the Civil War. Time Period was 1863-1865. Hilda Stahl is an awesome Christian Author. Loved reading her books.